Friends in Kampar, do take note! The Thai Food Carnival is now in your neighbourhood! 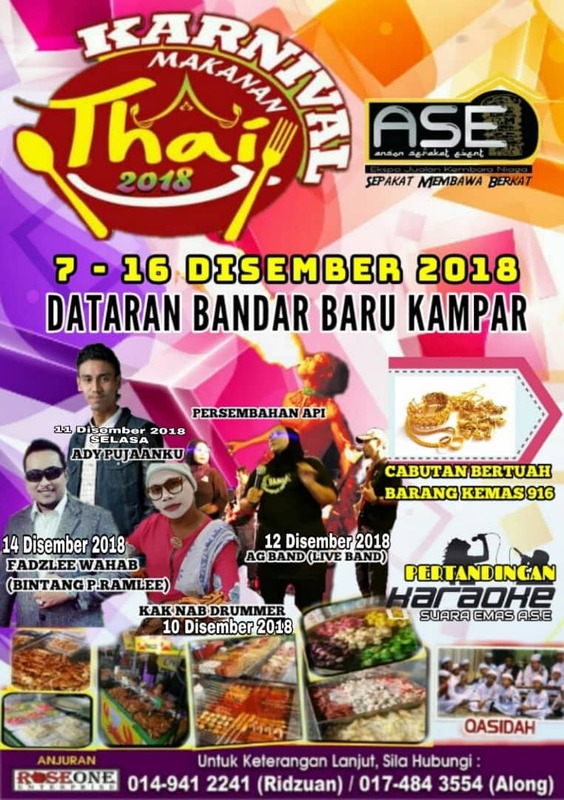 From now until 16th December, make your way to Dataran Bandar Baru Kampar anytime between 10 am to 12 midnight for some Siamese street food indulgence. Jointly organised by Anson Sepakat Event and JSL Event, there are 25 stalls offering some of the most popular Thai food and beverages. Alongside these, visitors can shop for items, such as clothing, shoes, accessories and more, sold by 20 vendors under the banner of Pesta Lelong A.S.E. A long list of activities has been lined up as well. Highlights include Pesta Lelong Buku (book sale), fireworks display, plus stage performances by local artistes, namely Ady Pujaanku, Fadzlee Wahab (Bintang P. Ramlee), Kak Nab Drummer and AG Band (Live Band). We have more good news for you. Visitors stand a chance to win attractive prizes in a lucky draw, from hampers to home electrical appliances. The grand prize is an elegant 916k gold bracelet. Every purchase of RM20 entitles you to an entry coupon to the draw. Check this post to see the Carnival in Ipoh last week. For further information, contact the persons in charge, Ridwan at 014-9412241 or Along at 017-4843554.